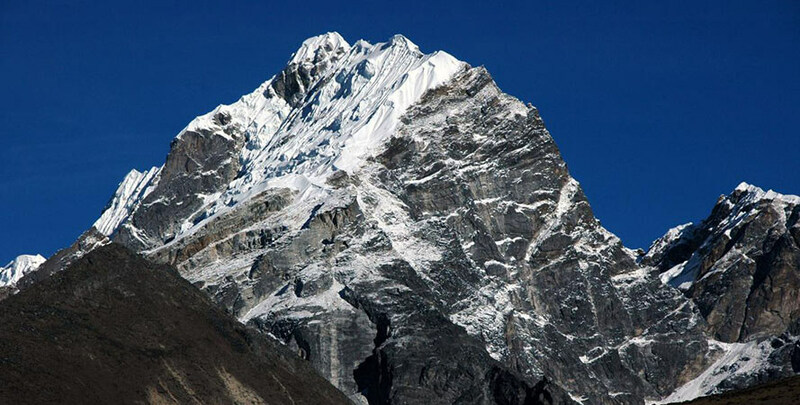 Lobuche Peak Climbing situated in the Everest Region stands at an elevation of 6119m. 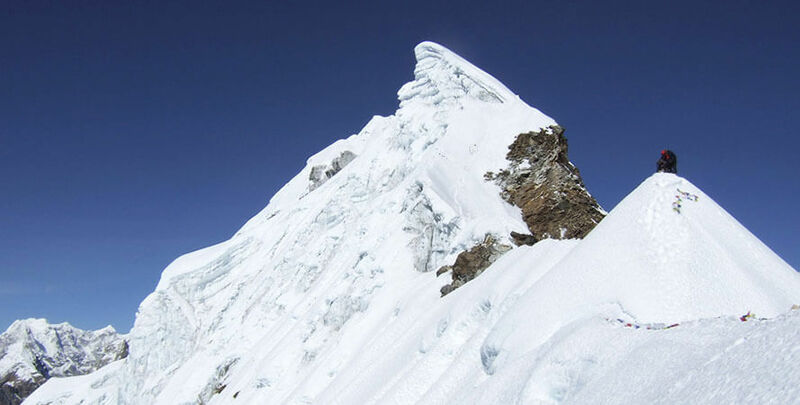 It is an alluring and most challenging summit that requires proficient mountaineering in a committed way. 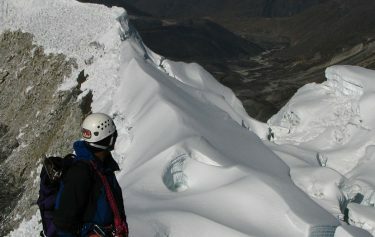 There are different tracks for climbing Lobuche Peak. The ordinary track for climbing is through south edge. 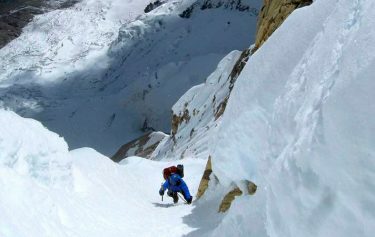 Lobuche east peak comprises of some small summits and the main summit requires climbing steep snow and ice slopes to the top from the summit ridge. The routs and summery of Lobuche peak climbing. The trek to Lobuche Peak accompanies the classic trail of Everest base camp trekking up to the spot call Pheriche and heads toward Dughla. 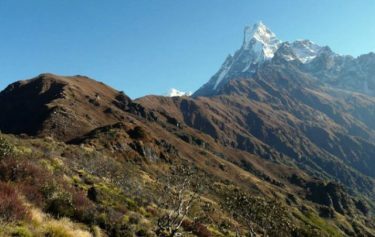 The base camp is situated up close to a lake underneath the south confront at an elevation of 4950m where we can view the astonishing scenery of mountains like Amadablam, Cholaste, Thamserku, Kantega peak and Tawache peak. 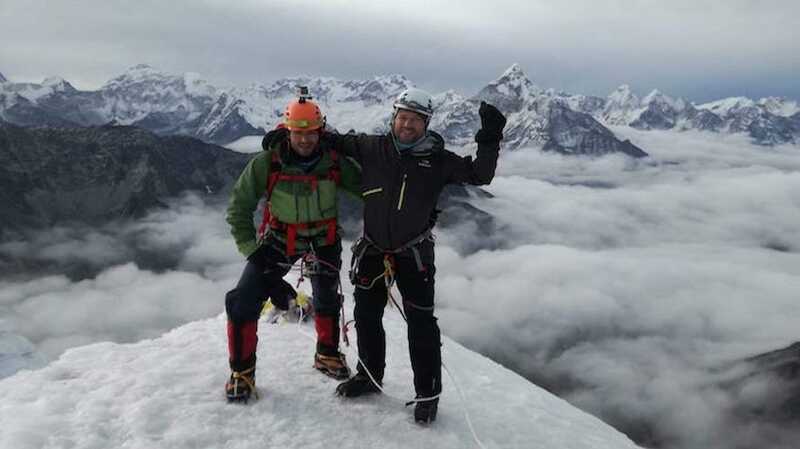 You climb steep stone patios and snow slants with the help of fix ropes and get access to the ridge overlooking Lobuche and the Khumbu Glacier where we arrange the high camp. Lobuche Peak Climbing pass follow the sharp snow ridge to the summit ridge during the trek. Then we follow the track to north-west passing few small snow bumps, notch and finally climb steep and truly troublesome snow slopes to the main summit. 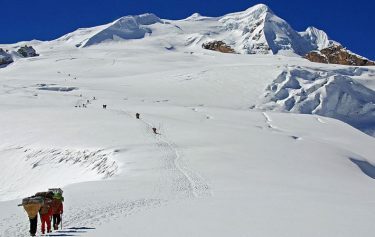 Lobche Peak climbing can also combine the Everest Base Camp trek as per the if the climbers interested with adding 3 more days. 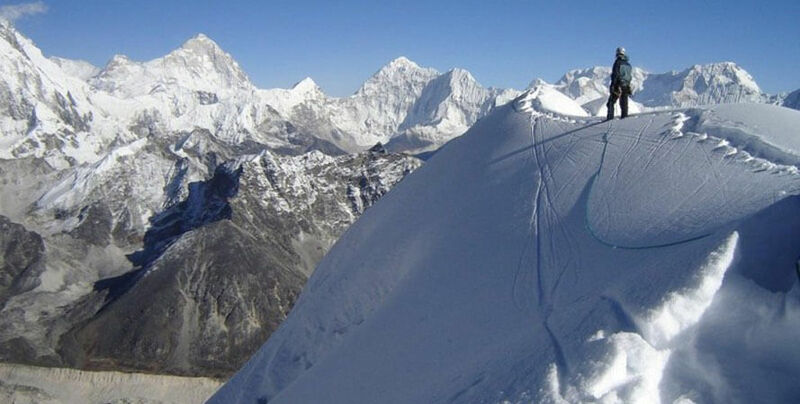 You May also add Everest Base Camp trek with this package. Day 03: Acclimatize day at Namche. Day 04: Namche to Tengboche: 4-5 hours (3,867m/12684ft) . Day 05: Tengboche to Pheriche: 5-6 hours (3,867m/12684ft) . Day 08: Trek to Lobuche base camp. Day 09: Base camp to Lobuche high camp. The trail leads towards the suspension bridge and easy uphill to the Monju from where Sagarmath National Park begins. After short National Park formalities, drop down to the river, the trail leads uphill to the Namche Bazaar. On the way you will have a great view of Mt. Everest, Mt. Lhotse, Mt. Kusum Khangru and more with beautiful valley. 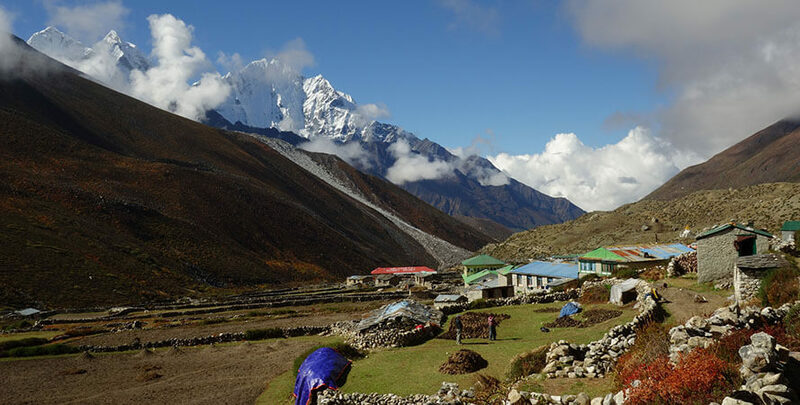 Explore the Museum, visit Khumjung village and Khongde village where you can enjoy the views of Mt. 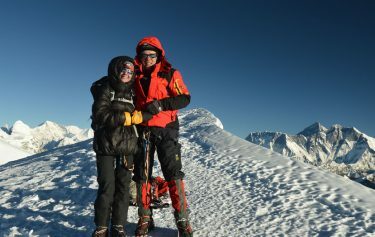 Everest and surroundings peak with Sherpa culture. Remaining of the day you can explore the Namche Bazaar where you can use the Internet, visit the National Park head office, Museum and monastery as per your interest and time. The trail leads you uphill and an easy winding trail towards Kyanjuma village where there are few tea shops with finest view of Mt. Everest, Mt. Amadablam and many more peaks. Steep climb through the pine forest all the way to Tengboche monastery which is very popular in Khumbu region. After sometime rest, will take you to visit Monastery where you will see the Buddhist regular ceremony at the monastery. At the beginning the trail drops slightly down and little climb after crossing the bridge to reach Pangboche. 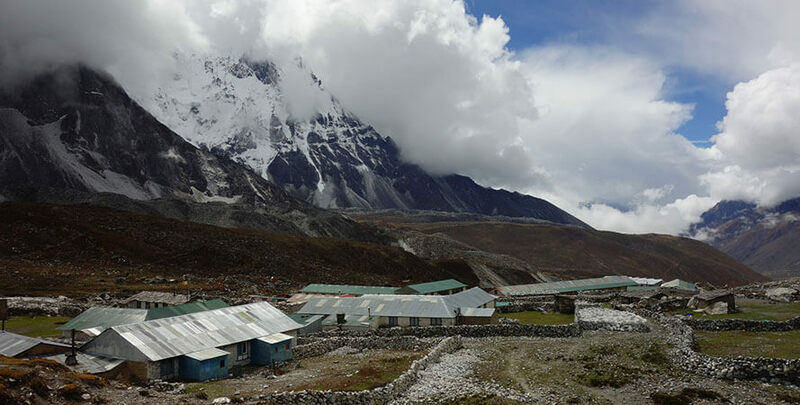 Pangboche is a popular Sherpa village. On the way you will have amazing views of the mountain with the highest mountain in the world. Evening stroll around the village of Pheriche. Today you walk around the village and climb up to the ridge where you can enjoy the beautiful scenery. It is always good to climb high and sleep low.? An easy walk at the beginning and after an hour walk the trail leads uphill and cross the bridge to reach at Duglha, the trail follows up to the top of the ridge which is nearby khumbu glacier and continue an easy walk to Lobuche. Days 08: Trek to Lobuche base camp. 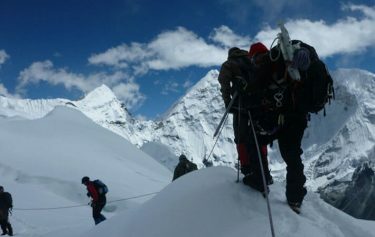 After Lobuche you leave the busy nappy trail to the Everest Base Camp and climb through the ridge to base camp. It is quite a steep climb but the view is superb where you enjoy the crystal clear Mountain View . Days 09: Base camp to Lobuche high camp. After breakfast our Sherpa will lead you to the high camp which is a rocky trail with enjoying the view of the glacier and valley as well as mountains. 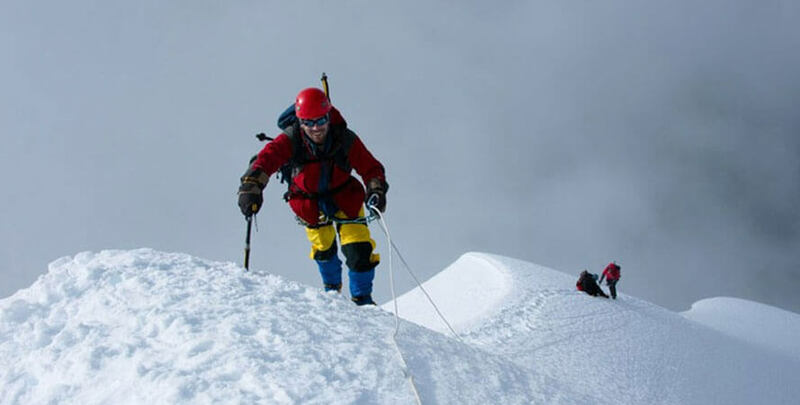 Our expert Sherpa will fix the rope and leads you to the summit where you will really enjoy your expedition. Then drop down to the base camp and continue down to Lobuche. The trail drops steeply down to the valley and cross suspension Hilary bridge over the Dudhkoshi River to get to Monju. After check out formalities at the national park office and an easy walk to Phakding. After that there are few up and downs to Lukla. The flight to Kathmandu from Lukla is always in the morning. Flight ticket from Kathmandu -Lukla - Kathmandu for member and staff. A trekking and climbing route map. Down sleeping bag and Jacket, to be returned after the trip. Medical kit box with normal medical supplies. Emergency rescue service arrangement, pay by your travel insurance. Season: Feb to June, Sept to Nov.